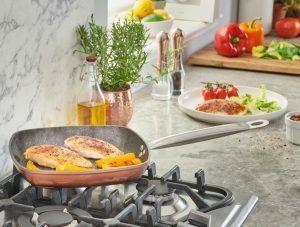 Pots and pans are something we use every day in the kitchen, whether we’re rustling up a culinary masterpiece or we’re cooking something quick and easy. 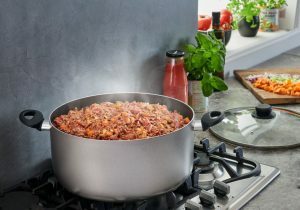 But with everything from copper tri-ply to aluminium available, which is the best pan for the job? 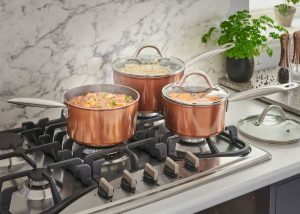 To help you buy your next pan, we’ve put together this guide, which will show you all the features and benefits of different pots and pans. With straight sides and a rounded bottom, saucepans are a versatile piece of cookware. You can often buy saucepan sets which include different sizes so you can get the quantity just right. They’re ideal for soups and sauces, for cooking rice, pasta or eggs and reheating your leftovers. Most saucepans come with lids, too, so you can control the evaporation of water inside if you need to. Another must-have in the kitchen, the frying pan has rounded sides and a flat bottom, which is why it’s perfectly designed to cook things over a very high heat in oil. You’ll find these pans in a variety of different sizes, but if you want to save on washing up, the best frying pan is one that has a non-stick coating. A stock pot (often referred to as a casserole dish) is the ultimate cooking pot as they allow you to brown or sauté before adding liquids to make stews, soups or stocks. Their large size means they’re great for cooking liquid foods that don’t need to be directly near to the heat source. They’re also great if you need to boil large batches of pasta, potatoes or noodles, etc. With their different sizes, they’re great for cooking for small or large groups, so it’s handy to have several of these on standby! The name of this pan gives the game away! Made for sauteing, they’re designed to allow you to fry food while moving it around quickly in the pan, covered by a lid. They also come complete with a flat bottom but they have straight sides which are deeper than a frying pan. Therefore, they’re just the job for searing, deep frying and creating particular sauces, e.g. a marinara. An all-purpose pan, woks have sloping sides that are high to give you great flexibility when moving things around in the pan, while also providing a hot bottom cooking surface and cooler sides. Traditionally, the best wok will be made from carbon steel and will be perfect for deep frying, steaming and stir frying. Want to give your cooking that professional grilled look? Then look no further than a grill pan, which has been designed with a ridged surface to cook meat to perfection. Their design also means they can cook many other things without using much oil, including eggs, pancakes or even a full fry up! If you want to eat as healthily as possible, a steamer is one kitchen accessory you want in your cupboard. Whether you use it as a vegetable steamer or to cook fish or meat in, steamers not only remove the need for oils etc. but they also keep all the nutrients locked in. Other foods you can use a food steamer for include eggs (hard-boiled, of course! ), couscous, pasta and rice, making it an incredibly versatile piece of cookware. Poached eggs are often a cook’s nightmare. How long do you cook them for and what technique do you use to get them just right? Thankfully, a poached egg pan can help you achieve perfect eggs, again and again! The best pan for poaching eggs will be one that includes at least four sections for your eggs, so they’re evenly shaped to give them a restaurant-class touch!